Hasan Harnett, the newly installed Tea Party chair of the NCGOP, has sent out a couple of clumsy and laughable tweets trying to link Hillary Clinton to the Ku Klux Klan. Say whaaaa? Call it the Huckabee Formula: say something so outrageous that it'll put you in the spotlight for a 24-hour news cycle, which is bound to raise your profile. Raising your profile at any cost is a good thing, right? 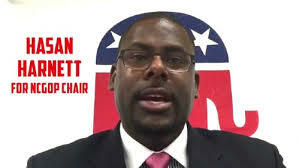 Former Virginia Foxx staffer and currently state Republican Party Executive Director Todd Poole attempted to defend Harnett and ended up sounding like he probably put his new chairman up to the original tweets: "The chairman isn't going to comment or give interviews on tweets, but as the first black chairman of the North Carolina Republican Party, he believes we have to learn from history and move past it." Yup. "Learning from history and moving past it" ... a new slogan for the NCGOP. What, exactly, was the history he was learning from and moving past?